The Big Wedding may win the award for best cast of the year, but is that enough to make this comedy about families coming together to celebrate the love of two people a solid film? Wedding movies have a spotted history in terms of quality (what is your favorite wedding movie?). For every Four Weddings and a Funeral, there are four that swing and miss. In any film, it’s a difficult task to tell the story evenly of a large ensemble and have all the characters shine and not have any feel like wallpaper. And with so much talent cast in The Big Wedding, first-time director Justin Zackham (who also co-wrote the screenplay) has his hands full. Previewed in The Big Wedding trailer, Robert De Niro headlines as Don -- the father of Ben Barnes’ Alejandro -- who is about to be married to Missy (Amanda Seyfried). 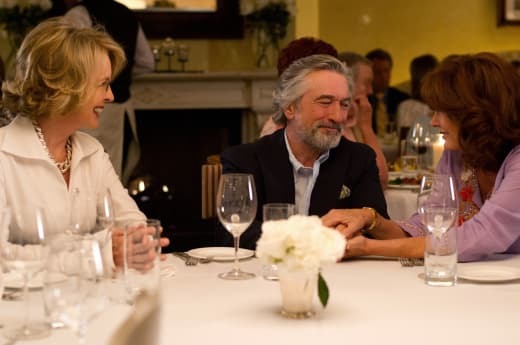 We first meet De Niro as he is romancing his decade-long love Bebe (Susan Sarandon). In walks his ex-wife Ellie (Diane Keaton) and yes… light laughs ensue. We meet our lovebirds soon after as they are sitting with the priest who will marry them. Although Robin Williams has played a priest before marrying a pair of lovers (in License to Wed), here he manages to pull back on the reins of his manic comic performance and honestly elevates every scene he is in. Unfortunately, he is not in the movie very much. Seyfried is not given much to do, other than to look embarrassed by her backward thinking parents. And Barnes, although we adore his work… are we supposed to believe that he is De Niro and Keaton’s adoptive son from Latin America? With all the great Latino actors out there, they hired a Brit to portray Alejandro? Barnes is a talent, there is no question. But, his casting leaves a bit of a bad taste in my mouth. Topher Grace and Katherine Heigl are Barnes’ siblings and they too are given little to do except orbit the action and provide commentary. Heigl’s character is a little more developed, and her turn may be her best in recent memory. But, both Grace and Heigl, like De Niro, Keaton and Sarandon, have their talents wasted by not enough solid material. The something old here is a tired wedding movie genre piece that never tries to be more than a caricature of wedding movies we’ve seen before. The something new arrives in the form of director Zackham. He does more with less than any director we’ve seen in some time. Let’s just say that our The Big Wedding review cannot wait to see what he does next given the lemonade he made out of this lemon.